Pieter Brueghel the Elder was an innovative Flemish Renaissance painter and printmaker, known for his sweeping landscapes and peasant scenes. He was apprenticed early in his life to painter Pieter Croecke van Aelst, and in 1551 around the age of 26 he as accepted into a painter’s guild in Antwerp as a master painter. 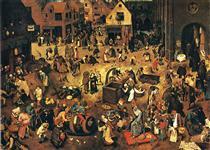 His nickname was “Peasant Brueghel,” as he would often don peasant’s clothing and attend social gatherings and weddings, in order to mingle and interact with the locals, and gain insight and inspiration for his paintings. He also fathered two other prominent Flemish painters, Pieter Brueghel the Younger and Jan Brueghel the Elder, although it is thought that they were not taught by their father, as he died when they were young children. The two main early sources for Bruegel's biography are Lodovico Guicciardini's account of the Low Countries (1567) and Karel van Mander's 1604 Schilder-boeck. Guicciardini recorded that Bruegel was born in Breda, but van Mander specified that Bruegel was born in a village near Breda called "Brueghel", which does not fit any known place. Nothing at all is known of his family background. 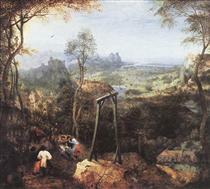 Van Mander seems to assume he came from a peasant background, in keeping with the over-emphasis on Bruegel's peasant genre scenes given by van Mander and many early art historians and critics. 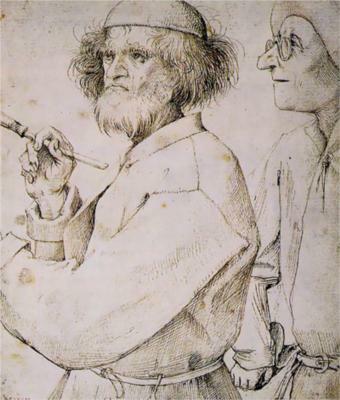 In contrast, scholars of the last 60 years have emphasized the intellectual content of his work, and conclude: "There is, in fact, every reason to think that Pieter Bruegel was a townsman and a highly educated one, on friendly terms with the humanists of his time", ignoring van Mander's dorf and just placing his childhood in Breda itself. Breda was already a significant centre as the base of the House of Orange-Nassau, with a population of some 8,000, although 90% of the 1300 houses were destroyed in a fire in 1534. However, this reversal can be taken to excess; although Bruegel moved in highly educated humanist circles, it seems "he had not mastered Latin", and had others add the Latin captions in some of his drawings.